There is the right of way of the Maryland & Pennsylvania RR that could be utilized to get to Towson. I’m quite familiar with the route. It goes through Sheppard Pratt & Towson U campuses. I have old maps that show the route. It could be followed to get across the street from Cromwell Valley Park. I’d love to see the route. Could be a great option for closing the gap between the trails? Also great this route connects with the University and other important places. If I had an e-mail address for you I’d send you what I have and offer to walk the route with you. Some of the route has been encroached, but there are options for bypasses to avoid the encrouchment. Northern Parkway – near the Gillman/Bryn Mawr bridge. Charles Street – you can still see the tracks, diagonal at the Exxon Station, near Eddies of Charles St.
York – Just south of the BC Public Library, the bridge abutments survive, now with a “T” Towson logo on each. The interior spiral ramp inside the library has old Towson pics, at least one of which shows a train crossing that bridge. Beltway – Between Rock City Church and what old-timers call Luskin’s Hill, now home to several stores, a gym, vet clinic, etc near Cromwell Bridge Rd exit. Beyond that it parallels Cromwell Bridge Rd, past the high school, but higher and maybe 50 feet to the east of CBRd, all the way to Cub Hill Rd. For connecting with the Torry Brown, the logical place to get to Loch Raven Watershed property is to cross CBRd onto Cromwell Valley Park, which ajoins LR Watershed. The Torry Brown Trail could be extended south to Mark Downs, off of York Rd. There is a train bridge over an arm of Loch Raven Res that is structurally sound, but just needs a new deck. This gets one very close to where the York Rd underpass used to be in Cockeysville. This whole project is very important, not just possible, but vital. However the way that the Americans with Disabilities Act is currently interpreted makes these sorts of project unlikely to happen. They now require that switchbacks be wide enough to accommodate an ambulance. That means that they are so very wide that entire hillsides are being paved in order to be sloped. The amount of paving required will make people that would otherwise in favor of trails to be opposed. The Corry Brown trail was built before the ADA. You can’t get money to build a gravel trail like the Torry Brown today, because it doesn’t conform to current ADA interpretation. The Jones Falls Trail (JFT) is built to ADA standards and the costs linked in the article reflect this. The JFT switchbacks are very well landscaped with native plants. The switchbacks (Druid Hill Park and near Round Falls) are some of the more scenic places on the JFT. It is nice that those that are disabled are able to enjoy the trail too! I totally agree that trails and buildings need to be designed with ADA compliance in mind. But the JFT switchbacks built 5 or 10 yrs ago met the interpretation of ADA at the time, but the interpretation has changed and any new construction involving Federal funds will need to be at least twice as wide. Somewhere in the city, I forget where, someone told me that they paved most of a hillside to get the trail up a hill while making it wide enough for emergency vehicles to access any part of the trail. I’m fine with the size and scale of the JFT switchbacks by the Steiff Silver Building. For switchbacks that are twice is wide, not so much. I think they are near Round Falls, so the same ones you mentioned. I also have an issue with not allowing the use of hard-packed gravel as a trailbed. I think gravel is more environmentally friendly as blacktop or concrete. That may require wheeled vehicles with slightly wider tires. My road bike, not so good on it, my hybrid, fine. Same with wheelchairs. If we have to pave everything or we can’t get it built, there will be a lot that is not built. As chair of the Maryland Committee of East Coast Greenway (greenway.org), I am quite familiar with the the necessity of completing this vital link for use by locals and through-riders alike. While a single route would do for through-riders, locals deserve a network of trails, and such a network is indeed possible. 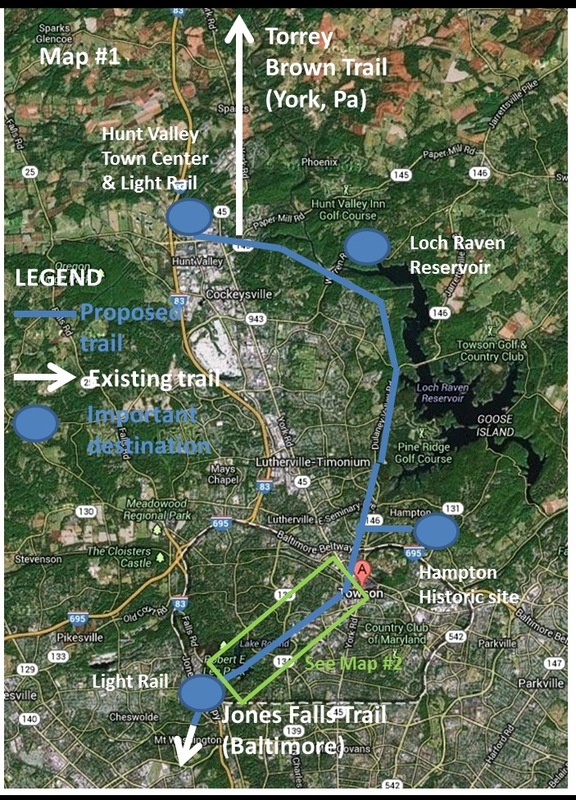 Rather than the admittedly scenic Loch Raven route, I suggest extending the NCR Trail to the Warren Road Light Rail station (already studied by MTA), then along Deerco Road and the Light Rail line to Ridgely Avenue in Lutherville, from which there are three options south. The western option follows the Seminary Road corridor to Meadowood Park, then south along Falls Road to where it crosses under I-83, where it picks up the former Greenspring Branch RR bed (already a rough trail) to Robert E. Lee Park. The central option follows trails and calm streets through Old Lutherville to the Charles Road corridor (wide shouders, possible cycletrack) to Woodbrook Lane, a calm dead-end lane, at the end of which is a graded rough trail to Robert E; Lee Park. The eastern option follows the Charmuth Road corridor to Dulaney Valley Road then (somehow) through Goucher, downtown Towson, TSU, and Sheppard-Pratt to Charles Street and along the central option to REL Park. Note that all three options end at Robert E. Lee Park, where the county has already built a trail from the dam to the Falls Road LR station. All that is necessary is to extend about a mile further south to Mt Washington Village and the Jones Falls Trail. These routes (well, the western and central anyway) are physically easy, politically maybe not so much. But bit by bit, they can, and should, be built. Thank you for sharing the analysis and work on the ECG. Looks like there are multiple options. We just the need the will to get it done. 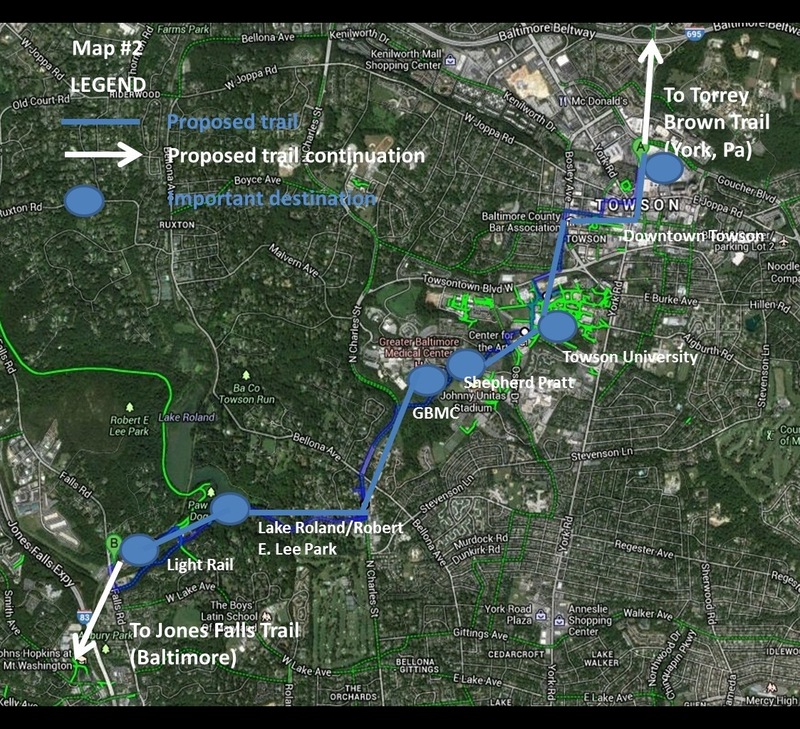 I do hope that Towson and TU are connected to the big trail directly or by spur. If you can point to the MTA study, I would appreciate it. The western route to get to REL Park sounds most practical, but any will do. I think the resistance, politically, environmentally and financially to carving a paved path along the western side of Loch Raven Watershed is immense. Utilizing mostly existing routes would make success much more likely. The unfortunate feature is that these routes bypass the 5 colleges/universities north of downtown, JHU, Loyola, Notra Dame, Towson U, Goucher. The Ma & Pa route has the advantage of running through TU, almost adjacent to JHU, and near the other 3. As for high schools along this route, they are too numerous to mention. But the real answer is probably a network as well as the through route as a backbone. Goucher is adjacent to the eastern option, which could be trail along Charmuth and maybe on-road accommodation thru Towson. Towson (don’t say State!) University can be reached either by the full eastern option or a spur, (either via sidepath along Towsontown Blvd, or the MA & Pa bed) to Charles Street and the central option. Towson is working on making its core more bike-friendly, but it would probably have to be a combination of trail (mostly sidepath/widened sidewalk), cycletrack, and bikelanes. JHU, Loyola, and Notre dame are on the city’s (on-road)Collegetown Bike Network, but there is spur-trail possibility as well, especially at JHU. It would be good to know on what terms the Baltimore Country Club consumed the Ma&Pa right-of-way that runs along their property. Do they have full legal title or can the gov’t put a trail along it. That section goes from Lake Ave, near Roland to Charles, near Stevenson Lane.